The ukulele is one of the easiest and most fun instruments to get into. 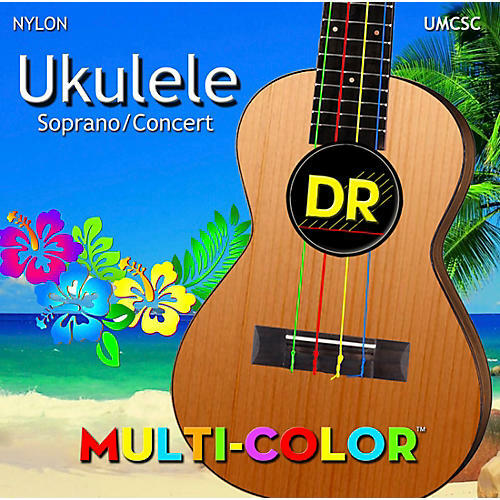 And if you're new to it, these Ukulele MultiColor Soprano Concert Strings make it even easier. A ukulele set up with multi-color strings says to the student, "This should be fun and easy." It's not as daunting as one with four regular strings. Imagine how clear and easy it is for any age student to understand a teacher who says, "3rd finger on the red string, 4th fret." instead of "3rd finger on the 2nd string on the 4th fret." DR HANDMADE STRINGS are well known and used by famous artists around the world. Now, with these Ukulele MultiColor Soprano Concert Strings you they're turning their attention and expertise into the ukulele world.